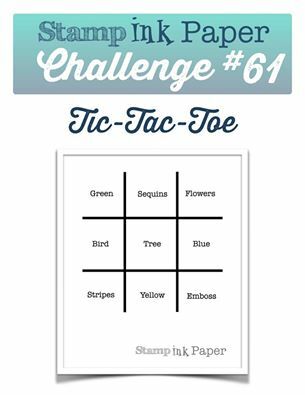 Happy Tuesday and welcome to our Tic Tac Toe challenge by Lisa this week at Stamp Ink Paper. I've decided to use the third vertical line Flowers, Blue, Emboss. Here's what I created using the Thoughtful Branches bundle, Woodgrain embossing folder and Decorative label punch. For the Blue I've used Cardstock of Dapper Denim and Soft Sky and combined it with Tip Top Taupe, Perfect Plum and Pear Pizazz to create my card. This is a closeup of the stamped and die cut flowers. 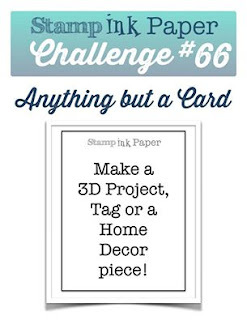 I hope you like my card this week and will play along with this challenge. Can't wait to see what you choose from our Tic Tac Toe board at Stamp Ink Paper.